If you've recently joined the UTV club (sometime's known as RTV's or side by sides), you've probably already started thinking about just how useful these machines could be for tackling weed spraying jobs. Finding the right sprayer for your UTV can be challenging - this guide aims to help you make a better decision by listing the top six things to consider based on operator feedback. Answering the three questions below will help you make a better decision around the type of UTV sprayer you purchase. With so many options on the market, its important to narrow these down first using the questions below to save you time. What will you be spraying? The type of weed or crop you're planning to tackle will determine your need for a UTV sprayer that is designed for boom or boomless nozzle spraying or handgun spraying. Many can do a mix of both tasks but all will be stronger in either one area or the other. Where will you be spraying? The terrain you're spraying in will often determine the size of the tank you choose. Flat ground - you can afford to load up a little more (keeping within the vehicle capacity of course! ), operating in hilly country? You should consider reducing the size of your tank and looking for a unit that keeps the center of gravity nice and low. How often will you be spraying? Spraying once a year or once a week will make a big difference to the type of equipment you consider. 12 volt pumps are a great option for occasional use but can be slow on a big job where a petrol engine driven pump is a better choice. If you've answered the questions above, it's time to start looking at what makes a great UTV sprayer! We've collected these points up from years of operator feedback and industry knowledge to make your job easier when it comes to researching and selecting your ideal piece of equipment. It goes without saying that your UTV sprayer is going to need to fit into the back of your UTV to be successful, but what is not so visible is the possibility that you could be overloading your machine and exposing yourself to safety & legal risks in the process. UTV manufacturers usually list a 'Cargo Box Capacity' on their specification sheets. For example the Can-Am Defender HD8 (a popular model with UTV spray operators) lists a cargo box capacity of 1000LB (454kg). Also listed on the spec sheet is a 'Payload Capacity' of 1500LB (680kg). It's important not to mix these two numbers up when evaluating the capacity of your UTV. 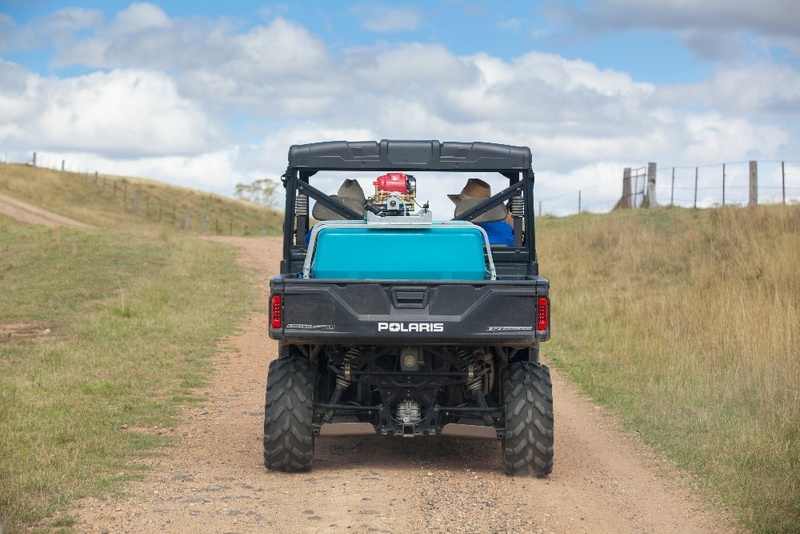 The 'Payload Capacity' refers to the total permissible weight the fully laden UTV is allowed to carry, including anything in the rear cargo box. So if you've got 454kg in the rear cargo box, the remaining capacity is 226kg. Put 3 big mates across the front seats and there's a good chance you're actually overloaded. An often overlooked feature when researching UTV sprayers is whether they have been designed with dedicated lifting and tie-down points to make your job easier and safer. Most UTV's have tie-down locations installed in the corners of the cargo bed and these are ideal for tying down your sprayer to ensure it doesn't slide around during use. 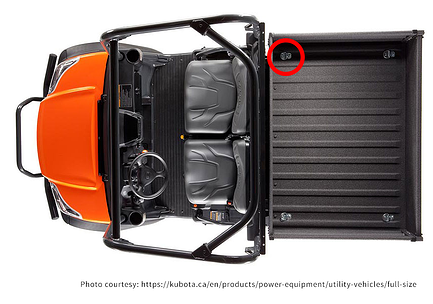 As shown in Kubota RTV-X Series, this UTV has four tie-down locations located in each corner. 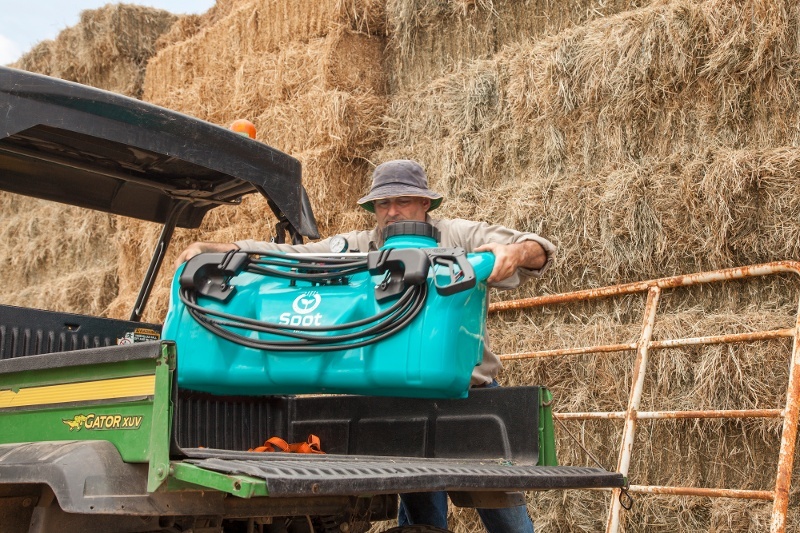 Purpose designed UTV sprayers like the Rapid Spray 'Sidewinder' & 'SprayScout' feature dedicated locations moulded into the tank that allow safe and secure tie-down using load rated ratchet straps. Tie-down locations should be located at least 150mm off the deck to allow the straps to clamp down at an angle of around 45 degrees for maximum effect. Your versatile new UTV sprayer isn't much good if you can't easily lift it into and out of your UTV when needed. While some smaller UTV sprayers can be lifted by 2-3 people, anything larger is going to need a mechanical aid like a forklift or fork tines on your tractor or loader. Many of the best UTV sprayer designs feature built in semi-enclosed forklift lifting points to enable easy and safe lifting of your UTV sprayer on and off your vehicle. Another benefit of these built in forklift points is they way they protect the bottom of your tank from puncture or damage caused by forklift tines or storage on rough and rocky ground. 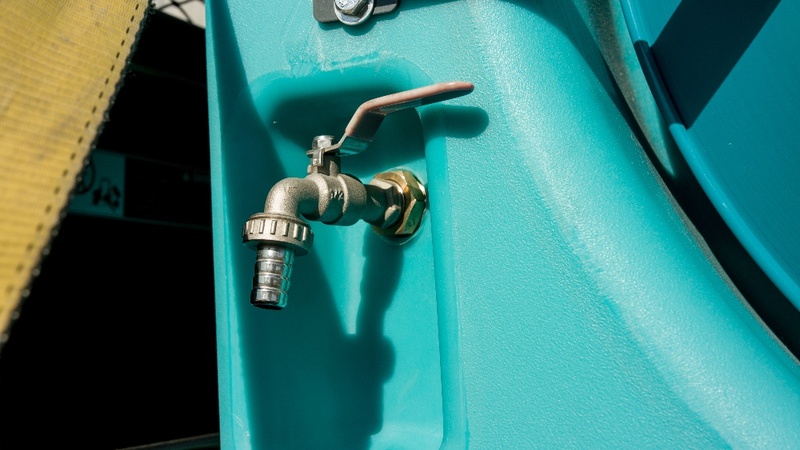 If the tank on your UTV sprayer doesn't drain to a central point, then you are going to have trouble removing all of the contents during spraying and run the risk of cross contamination with other chemicals when you change jobs. Well designed UTV sprayers feature sloping tank bottoms and dedicated sumps that cause the liquid to drain to a central point for collection and drainage, preventing these issues. 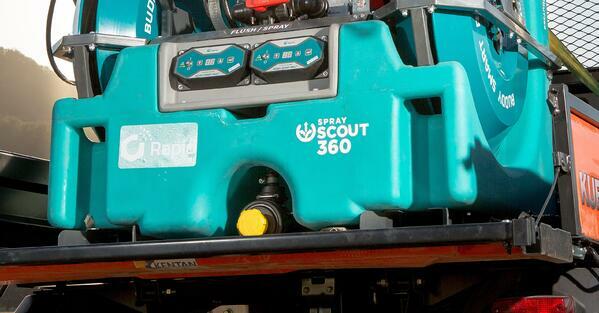 An example of this is the Rapid Spray 'SprayScout' with the drain valve located at the front. Some smaller units can be designed to help overcome this issue by having an outer channel running around the edge of the tank to collect liquid and direct it towards the suction and drainage points like the 'Sidewinder'. If you answered the three questions at the start of this article, you'll have some idea of what kind of pump you might want on your UTV sprayer. The two main types of pumps found on UTV sprayers are 12 volt and engine driven. 12 volt pumps are perfect for smaller spraying jobs because of their light weight and quite operation. You also don't have to worry about carrying around additional petrol and the hassle of filling petrol tanks and checking oil levels. 12 volt pumps are common on smaller UTV sprayers such as the 'Elite Pro' and 'Spot Ranger'. Engine driven pumps can come in petrol or diesel versions. Engine driven pumps are typically much more powerful than 12 volt pumps with pressures up to 580 PSI and flow rates up to 54L/min on units like the 'SprayScout'. When considering an engine driven pump, look for well known brand names such as Honda and Yanmar or Kohler. The last thing you want is that Chinese copy engine letting you down in the middle of spraying job. Every piece of spray equipment requires maintenance to keep it in top condition. Simple maintenance such as draining and rinsing your tank and pump system with fresh water after spraying can turn into a nightmare with poorly designed or non existent drainage points and plumbing. 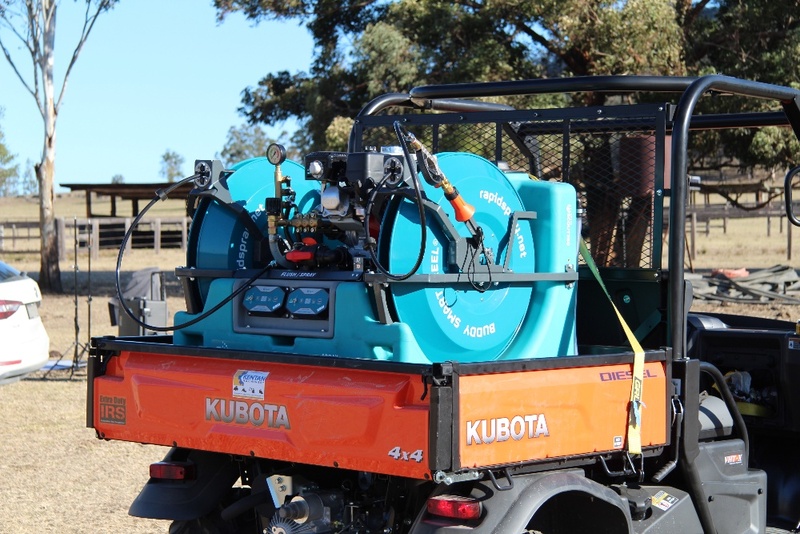 Some modern UTV spraying systems feature on-board fresh water tanks and 3-way rinsing systems to make the end of day cleaning job a breeze that anyone can do. Pump maintenance such as cleaning and replacing inlet/outlet valves can be made much easier if the unit is designed so that these tasks can be performed without removing the pump or motor from the tank - like the Maruyama 3 piston pump fitted to many models of the 'SprayScout'. Everyone know's that things do go wrong - so it's important to ensure you're purchasing Australian Made equipment backed by strong manufacturer warranties. Your UTV sprayer is likely to end up with many different spraying jobs. These jobs can be made easier by the additional of accessories such as booms, boomless nozzles & remote controlled hose reels such as the 'Buddy Smart Reel'. Booms for UTV sprayers can come in many different sizes from 2-8m depending on the size of job you're tackling and the speed with which you need to complete it in. 'Poly Booms' are a popular choice for UTV sprayers because of their extreme durability and flexibility to take hits without suffering damage. Boomless nozzles are another popular accessory that can provide a spray width up to 10m wide without having anything protruding past the edge of the UTV - great for areas with lots of trees! These work by propelling high pressure liquid out a long distance before it falls to the ground so they are best for very still (no wind) days and job's where high accuracy is not required. Remote controlled hose reels are fantastic accessories for hand spraying, completely eliminating the need to hand wind your hose up after use and making it possible to reach areas up to 150M away from your UTV. The Buddy Smart Reel from Rapid Spray is a great choice with features such as My-Pace variable rewind speed and a powerful radio signal that can punch through thick trees and over steep terrain with a 2km line-of-site range. UTV's are fast becoming the vehicle of choice for many people wanting to get around their properties fast and safely, and their benefits with being able to carry large loads while easily traversing any terrain is unparalleled. 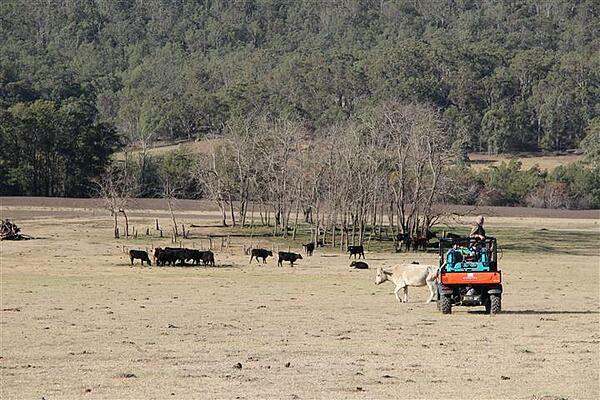 With Australia's propensity towards deep gullys and hard to reach places, weed control is no easy task. 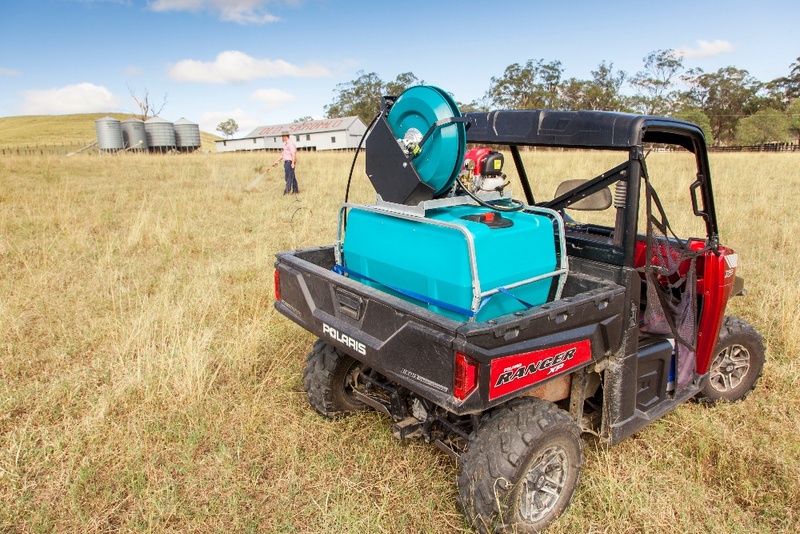 Making sure you have the right sprayer to suit your UTV is paramount. Focus on these six important things - carrying capacity, lifting and tie-downs, tank drainage, pump performance, maintenance & warranties and available accessories - and you are sure to find a UTV sprayer that's not only up to the task, but safe and reliable as well. What to know more the Rapid Spray UTV Sprayer range? View the full range here such as the Spot Ranger, SprayScout, Marshal, Sidewinder, ElitePro or the Spray Ranger. Is there anything more that you look for in a UTV sprayer? Let us know in the comments or if you any questions, feel free to leave a comment - we look forward to hearing from you!